A simple and durable piece of training apparel from Clinch Gear. This rashguard has all of the essentials and none of the gaudiness. If skulls and crossbones aren't your thing, then you'll appreciate the classic look of this rashguard. Made from a 80/20 nylon-polyester blend, the fabric feels nice and light without sacrificing sturdiness. The full tricot weave of the fabric keeps the interior surface soft and the exterior surface great for extended training sessions. Email your friend about the Long Sleeve Clinch Gear Rashguard - Red. 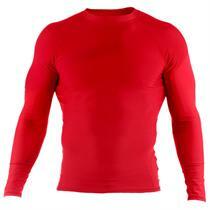 Ask a question about the Long Sleeve Clinch Gear Rashguard - Red.